Although there are almost 100 species of small trees, lianas and shrubs in the genus hydrangea, the ones most commonly cultivated in the home landscape are the flowering shrubs. The flowers of these shrubs are called either mopheads--the big, pompom flowers--or lacecaps, with a flatter aspect. Hydrangea is an easy plant to grow and can become a large, showy centerpiece of the garden. Fall is the ideal time to plant your hydrangea. Determine where you will plant the hydrangea. 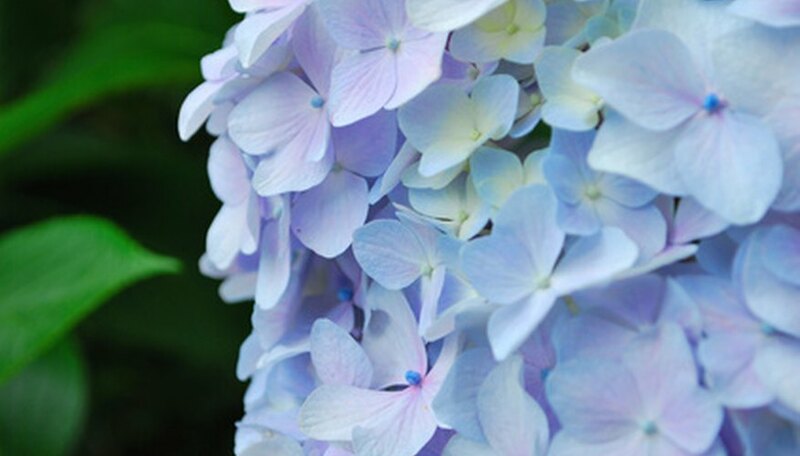 Keep in mind that most hydrangea need morning sun and afternoon shade. The peegee hydrangea can tolerate sun for a full day. The planting location should also be one in which the hydrangea can grow to its full size without being crowded. Plan on it growing to 4 feet by 4 feet. Pull all the weeds from the planting area. Weeds compete with landscape plants for moisture and soil nutrients. Aerate the soil by digging into it to a depth of 12 inches. As you dig, turn the soil and crush it so that it becomes light and airy. Add a 3-inch layer of compost to the soil and mix it in well, to a depth of 8 inches. Test the soil’s pH. You can do this yourself with a home pH testing kit, available at large garden centers. You can also deliver or mail a soil sample to your county cooperative extension office where, for a nominal fee, they will test the soil and provide recommendations on materials to use to amend the soil to the proper pH. A high pH will turn your flowers pink whereas a low pH (5.0 to 5.5) will make them blue. Add the amendments required by the pH soil test and mix them to a depth of 12 inches. Rake the soil until it is level. Dig a hole that is the same depth and three times the width of the pot in which the hydrangea is growing. Use the gardening fork to lightly scrape the sides and the bottom of the hole. This will loosen the soil and allow the roots to more easily penetrate. Remove the hydrangea from the pot by turning it over and giving it a sharp rap on the bottom. If the roots are wound tightly around the root ball, use your fingers to gently loosen the outside layer of roots. If they are tightly packed, use scissors to cut into the outside layer of roots and snip them. Place the root ball on the bottom of the planting hole and backfill the hole with soil. Use your feet to pack the soil around the base of the plant and to remove any air pockets. Water the hydrangea until saturated. When the water drains, spread a 3-inch layer of mulch around the base of the plant, keeping it 2 inches away from the trunk, and spread it out 1 to 2 feet. The mulch will help to protect the hydrangea’s roots during the winter.